Why Pressure Wash Your Driveway? Pressure washing your driveway is the easiest and quickest way to remove the stains. It’s also one of the easiest ways to add both curb appeal and value to your home. 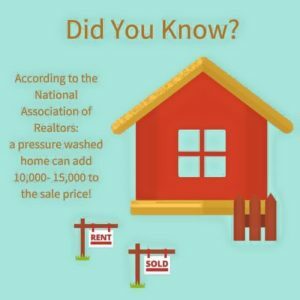 According to the National Association of Realtors, professional pressure washing (for the home and driveway) can add anywhere from $10,000 to $15,000 to the value of your home, making pressure washing one of the most cost-effective and time-efficient cleaning techniques.